Very many thanks to Sophie Taylor of the Manchester University Law Society Magazine ‘Mandatory’ for the following review of my new book Law and Peace. You can buy the book on amazon. As I’m sure every law student is well aware of: law is NO easy ride. The prospects of being thrust into the legal world are daunting to say the least. No matter how many text books we read, or how much we think we have prepared…the fierce competion that greets us on arrival will undoubtedly be a tremendous shock to the system! No longer pacified by university comforts, the high stakes and intense nature of crawling up the ladder of the legal profession, may leave some students throwing their toys out of their pram! This is certainly the case in Tim Kevan’s hilarious ‘Baby Barista files’, which follows the journey of ‘Baby Barista’ from his first day as a pupil to his subsequent year of tenancy. Both books provide a riotous account of the backhanded tricks; unscrupulous efforts; and down right outrageous strategies employed by pupils. The frantic attempts of those trying to embark from the nest of academia, into the role of a high flying legal eagle prove to be highly amusing! In Baby Barista’s case it is evidently not a smooth transition. For all those students considering a career at the Bar I would suggest these books to be an essential summer read! Although the files are purely fictional, the author Tim Kevan has experienced his fair share of law and disorder in his previous career as an ex-barrister. He initially wrote the first book as a humorous blog which was later snapped up by Bloomsbury publishers, and released in 2009. Since its publication it has gained mass support. The Times praised the works referring to them as: ‘ A cross between the talented Mr Ripley, Rumpole and Bridget Jones diary’. Such a review draws attention to the side splitting nature of the books as they take an alternative and refreshing outlook on the journey many of us students will soon embark on. With an array of fantastic self-explanatory characters such as ‘Busy Body’ and ‘Old Smoothie’ the interactions that ensue could be accorded to that of a school playground. The Chambers are symptomatically laced with the scandal and gossip of ‘who has been caught sneaking behind the bike shed’, and the calculated manipulation of classroom bullies! Faced with financial pressures, Baby Barista plunges right into the heart of such school boy tricks, and will not let anything get in his way. The ensuing chaos of juggling mischievous tactics whilst gleaning a squeaky clean façade stimulates much enjoyment. The innocent professional failings in court are also highly engaging and humorous. Highlights include an overzealous sneeze causing his wig not only to fall off but to fly into the judge’s lap, not to mention a brief brush with the law himself! These are merely a snippet of the droll situations this pupil finds himself in. Although fiction – such pandemonium seems out of this world! Pure comic genius! Moreover the follow on book which is to be published on the 3rd May follows ‘Baby Barista’ into his professional career of first tenancy. It is packed with comical situations including corruption in litigation, revenge from previous competition and the quest for a prestigious red bag! The web of lies and tricks have certainly not been locked away and are once again causing conflict. As well as career desires Baby Barista also tries to win over the affections of a fellow pupil, but his immersement in work might be set to jeopardise his chances. 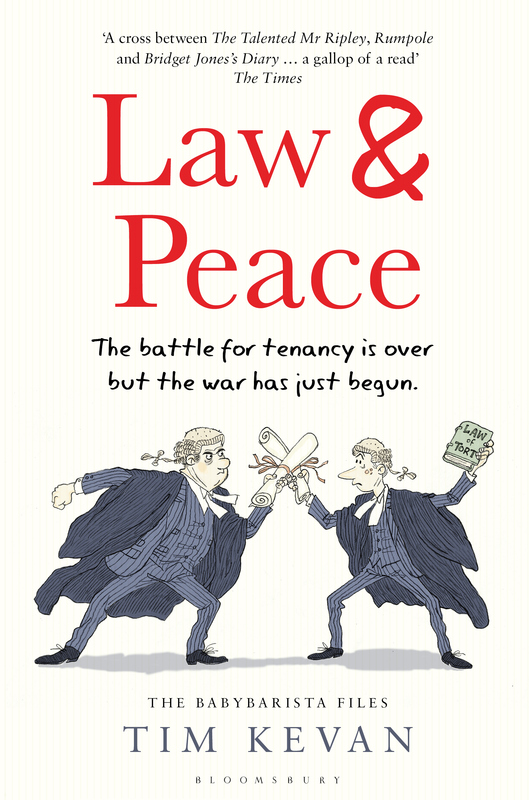 With tales of ‘Batman boxer shorts, liquid lunches, drunken court hearings, and brushes with the ‘Bar Standards Board’ it is clear that Law and Peace provides an equally entertaining tale. Both books are captivating and hard to put down. This is mainly due to Tim Kevan’s fantastically contemporary writing style which serves to keep you on your toes and literally laugh out loud. With legal speeches parodying that of Catherine Tate ‘Bovvered’, references to Little Britain, and various unconventional parodies, there is certainly never a dull moment. Such a sense of humour is much needed in the legal world. I would certainly recommend this book as a light-hearted, post exams cathartic wind down, and perhaps even preparation for commencing your pupillages! No objections here your honour!